As self-defense and tactical instructors, we are always working hard to give our students a more realistic training experience. This is especially important to my group, CORE, where we focus on a mix of hand-to-hand and armed self-defense for gun owners. A while ago, we went looking for a bag that we could use in our classes. We needed something that students could beat up on more than they could on a living training partner. And, again, we wanted as much realism as we could pack in. Enter BOB, from Century Martial Arts. The BOB, or Body Opponent Bag, has been around for some time. 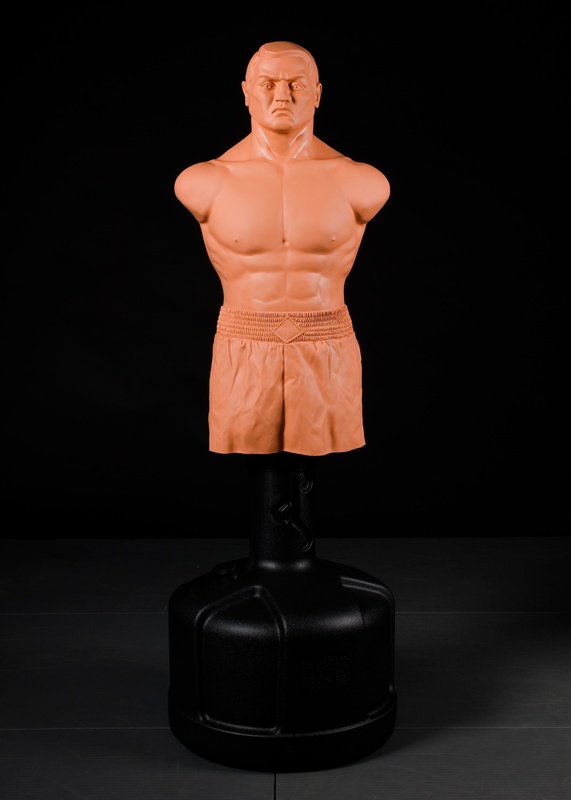 He’s popular in the martial arts and boxing communities, and his human torso – plus his angry face – make him perfect for self-defense and tactical instructors too. We’d been using BOB with great success in our tactical classes for a while, when an idea started to form in my mind. We knew he could stand up to the continued beating of strikes and kicks. How well would he stand up to actual live fire? That’s right: we decided to shoot BOB. Specifically, a BOB XL. 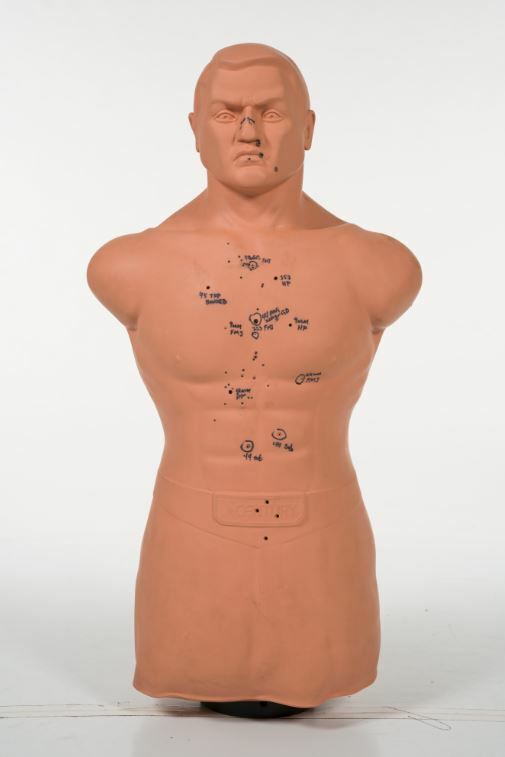 We wanted a longer torso, since we planned on shooting him the same way we train our students: by aiming at the largest center mass. And we weren’t going to just shoot him once or twice. Oh no! We were going to shoot him with everything we had at our disposal: 9mm, .40, .45, .357 (both full metal jackets and hollow point ammunition), and .223 and .44 magnum. The day before we headed to the range, my team and I discussed what we thought the outcome would be for poor BOB. There were mixed opinions. The more optimistic ones thought that BOB would hold up well at first, but the damage to the internal parts of his base would leave him unusable. Some just thought that after a few shots, BOB would start to look like the remains of a frat party in the park: trashed up and with stuff spilling out everywhere. One thing we all agree on: this was going to be fun. Like, little-kid-at-Christmas fun. The next day, we brought BOB out to the outdoor range, set him up, and took aim! This is BOB after taking over 50 shots, all from a range of 10 yards. 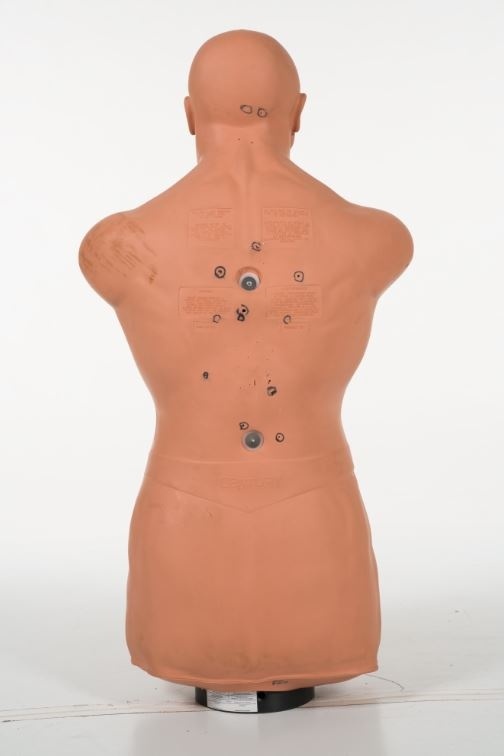 As you can see, we marked some of the exit and entry ‘wounds.’ Some (the .45) are clearly larger than others, but BOB’s ‘skin’ held up well, with little to no tearing. Every shot passed clean through, so we’ll be able to use him again as a punching bag without worrying about anyone striking a bullet. The internal stand (that holds BOB onto the base) held up well too! The plastic was a little scuffed, but it was still easy to slide him off and back on to the base. We were more than pleasantly surprised by the results! BOB proved us wrong and held up like the champ he is. By our evaluation, he could and will take much more! Unless we shot him consistently with a hollow point greater than .40 caliber, we expect that he’d hold up for quite a while – and we plan to take him out again to see just how long “a while” is! The next time we test BOB, we do plan to limit our ammo to .40 & 9mm full metal jacket ball ammo. This is the typical ammo used for range practice by most avid shooters and hunters. We’ll be back with updates on our results, so stay tuned! So, why use BOB and not just a paper target? Let’s face it: there’s only so much the traditional flat paper targets can do. Even though some of the nicer ones come with designs that look like silhouettes, or even images, of people, they’re still just one-dimensional targets. You can’t practice shooting from angles other than looking at the target straight on. The anatomy of a sheet of paper, even with a human drawn on it, isn’t as close to the real thing as BOB’s. 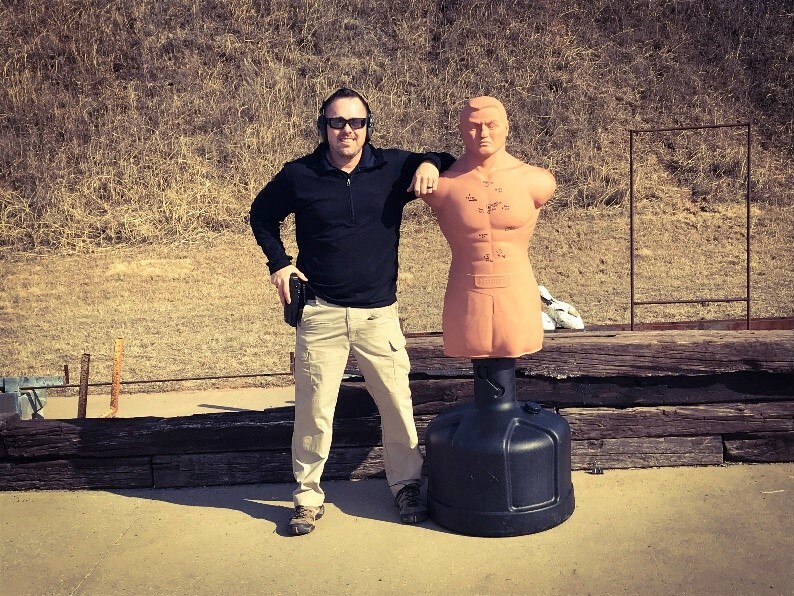 We’re all about making training as realistic as possible – while staying safe – and BOB gives you the perfect way to do that. Want to work on your own tactical hand-to-hand and weapon training? Look for upcoming chances to train with Core Protective Solutions. Have you tried using BOB for shooting practice? Leave us a comment or video. If you haven’t, you’re missing out! PS: I know we don't need to tell you this, but use the same safety procedures when you use BOB as you would with any other target or live-fire drill.